First, the good news. Last week’s winter storms had minimal effect on spot market truckload freight rates and load-to-truck ratios. Now, the bad news. Both managed to slip all on their own-- with rates in the three major sectors being the lowest in at least the last four weeks. This is according to DAT Solutions, based on its network of load boards. It reports the total number of spot market loads fell 10% for the week ending Jan. 23, compared to the previous week, while available truck capacity rose 2.2%. Van load posts fell 13% while truck posts rose 2%. As an outcome, the van load-to-truck ratio declined 14% resulting in 1.4 van loads available for every truck posted on the DAT network. The national average van rate dropped 3 cents to $1.65 per mile. Flatbed load volume declined 8% and available capacity increased 4%, which sent the load-to-truck ratio down 12% from 8.3 to 7.3 loads per truck. 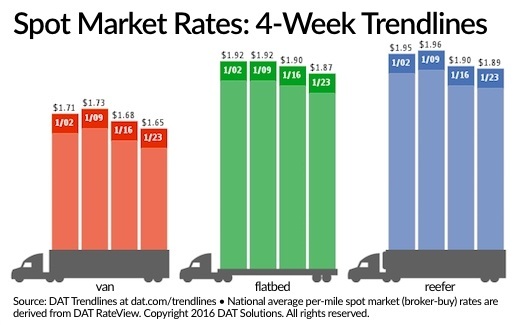 Average flatbed rates edged 3 cents lower to $1.87 per mile. The number of posted reefer loads fell 11% while truck posts increased 2%; softer demand helped push the national average reefer rate down 1 cent to $1.89 per mile and the load-to-truck ratio down 13% from 4.0 to 3.5 loads per truck. On one slightly positive note, diesel prices fell another 4 cents to a national average of $2.07 per gallon, setting another five-year low, according to DAT. However, changes in load-to-truck ratios often signal impending changes in rates, meaning they are likely to continue falling in the near term. According to DAT Analyst Peggy Dorf, writing in the company’s blog, rates are expected to increase but that's not expected to happen until the second half of the year, with small hope it could even happen in the second quarter. “Right now, carriers can take advantage of low fuel prices during the slow season, to get acquainted with new customers, new markets and new cargo types that require freight transportation. When freight picks up again in the spring, you'll be ready,” she wrote.